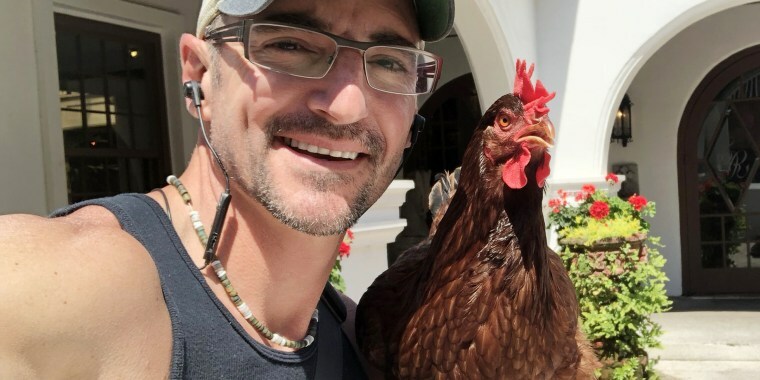 Dave Cox says he adopted the chicken after his beloved pet dog died. Now, his adventures with Sammi are gaining a big following on Instagram. A dog may be man's best friend, but for Dave Cox, a chicken is a close second. Cox's story went viral this week after a Jacksonville, Florida, news network wrote about Sammi the chicken — Cox's 1-year-old Rhode Island red hen — and her burgeoning Instagram account. But Cox, 43, says his path to Sammi — whom he frequently takes to the beach with him — started nearly 20 years ago with a blue heeler puppy named Cort. "Cort and I had a very close relationship," the self-employed residential general contractor told TODAY. "He died when he was 17. It was very sad and I truly believe I will never find another dog like him. We just had a connection." "After he passed, I knew I wasn't ready to take on another dog," Cox continued. While he wanted a new pet for companionship, Cox hoped to find one that was unique and "outside of the norms." "What possessed me to consider a chicken, I will never know," he said. Cox walked into a feed store in his hometown of Destin, Florida, in March 2017 and went home with a 3-day-old baby chick. Before long, Cox decided to allow Sammi to live inside his home and began training her to ride beside him on the passenger seat of his pickup truck. "She started going with me everywhere," Cox recalled. "We'd just go to the beach; we love to swim in the ocean together and we would go on adventures. I would just always take her with me." Cox says during their travels to places like St. Augustine, Florida, and New Orleans, Louisiana, thousands of people have approached him, asking to hold Sammi and get a photograph with the charismatic bird. "People have never touched a chicken before and they think she is so amazing," said Cox. "They would ask for a picture with her and then say, 'I'm so posting this on Instagram — what's her Instagram account so I can tag you?'" Cox knew nothing about Instagram before all this, but after a trip to Panama City Beach, Florida, this past February, he decided to create an account to document Sammi's adventures. Until this week, Sammi's Instagram account had around 200 followers. After going viral, the hen has thousands of fans. But Cox says their brush with fame will not deter his and Sammi's travel plans. The duo is planning upcoming visits to Savannah, Georgia, and Cedar Key, Florida, and have been invited to visit fans in places as far as Washington and Texas. "I'm not sure how I'd get her on a plane," joked Cox. "She's not my emotional support animal; I am her caretaker." So how does having a chicken compare to dog ownership? "Chickens are very different," said Cox. "A dog will greet you, lick your face and jump up on you. Chickens are not like that, but Sammi and I have a bond. She knows my voice and she recognizes my face and she knows me." "She's my companion. We've bonded and — with a lot of patience and remembering her brain is the size of a pea on my part — we have learned a lot about each other."